I have some customers still running some old A2-Series switches for some "dirty work" in non-important places of the network. 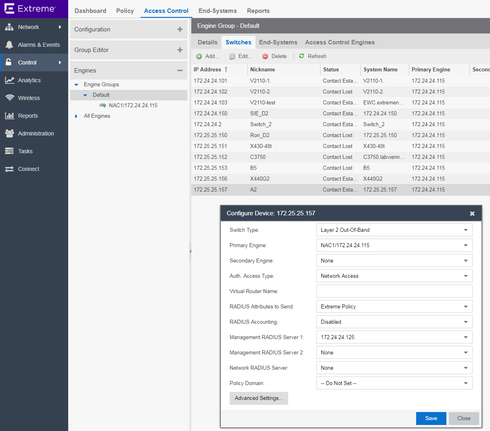 Until the release of 8.1 the customer was able to use the Policy Manager to configure and manage these switches for Radius and Authentication (MGMT, MAC and 802.1x) (no policy support), but since the upgrade to 8.1 it now shows as UNSUPPORTED, despite it's shown as supported on the EMC Supported Firmware Guide. The customer want to use these switches do monitor the Power Grid meters, Water tower and other less-critical applications in HOSTILE environments that A2 can handle easily (belive me when I say HOSTILE). Anybody saw something like it? Can you clarify if something in Policy Manager or Extreme Mgmt Center is not working or are you just seeing that it says "not supported" somewhere and FW Notes that say it is supported. As an FYI, the A2's are End of Life and are no longer supported, but they may still work with certain versions of NetSight/Extreme Mgmt Center. EMC 8.1.3.65 (the issue started on the 8.0 release, on 7 it worked as expected). A2H124-24 with the latest FW release (as I said, the customer decided to keep these legacy switches to very specific and "less noble" applications in the network... Only 3 still alive in this particular customer, besides some B2/B3 we are working to replace by X440-G2). The issue happens when you try to add (or do anything) with A2 on the PM (Web or Java) to the Policy Domain. It shows a message showing as "Unsupported", and the customer is not happy having to configure Radius and Auth using the CLI. I understand the EoSL of A2 (and obviously the fact that A2 doesn't support policy), but I think this feature should be there (there's references to the jurassic but unbreakable E1, fortunately already discontinued by all my customers), to allow customers to configure the supported Authentication (MGMT, MAC and 802.1x to ports) and Radius Servers for these switches using the UI. Is the customer using NAC for MGTM, MAC and 802.1X or another RADIUS. The customer uses Microsoft NPS for auth. I haven't tried to add an old E1 (even older and long time discontinued, and dumped by the customer) to the domain, but I think it would be allowed, but A2 is now "unsupported".